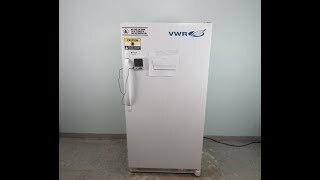 The VWR -20 Freezer provides basic everyday storage of your common non-critical samples and lab supplies. This upright lab freezer is manual defrost and has an adjustable temperature range of between -10 to -20°C. This -20°C Lab Freezer uses a CFC-Free high-density urethane foam insulation under a smooth interior and has ample storage space, with 3 evaporator shelves, a full access sliding storage basket, and a variety of adjustable door bins. This 17-cu ft upright Freezer comes with built-in mechanical thermostat to allow user to adjust temperature. This VWR -20 Lab Freezer SCBMF-1720 has been fully inspected and comes with a current temperature validation report. All of our lab equipment comes backed with our standard warranty. Should you have any questions, please don't hesitate to contact us.